So the big question is, which fighters will be in production then? F-35 – Confirmed and there will be ~1300 F-35s flying by 2025. Rafale- Confirmed (The French recently announced plans for additional aircraft out to 2025). Super Hornet – Unlikely. With only Kuwait to go for export and likely limited USN purchases going forward its days are numbered. Eurofighter – Probably. It will at least be in production until 2022 when the Canadians plan to sign a contract so if selected it would be able to continue production and fulfil a Canadian order. Gripen E – Unlikely candidate but will be in production in that timeframe. Depends a lot of other countries' decision. Other than unpredictable ME countries purchasing unpredictable amount of unpredictable planes, in Europe at least Finland will buy a rather equal amount of rather similar planes probably just before Canada (Poland etc less likely and smaller amounts). Finnish conditions are rather similar to Canada (cold weather, road strips to be used as airfield) but military environment is very different. There is a small chance that Finland will make Eurofighter to survive until Canadian order and smaller chance for Super Hornet (if that is politically eligible for Canada anyway, but which is then). I think over the last 3 months the chances for the Rafale have not been reduced. The partnerships between US (Trump), France (Macron), Canada (Trudeau) and Germany (Merkel) changed of time. The US decided to focus on their own needs / interest and that's their good right. It does depend. While Rafale will have domestic orders past 2022 the UK and Italian Eurofighter lines will be reliant on exports, which are already identified, as I don’t see any further orders coming from the partner nations. There has been a change in the fortunes of the SH and a saving grace for Boeing as the US in their just released defence budget stated a plan to continue procuring SH, so that will continue into the early 2020s, ensuring that there is at least a production line available to order from. I haven’t seen any reports further to the earlier statement that Boeing hadn’t even bothered to turn up to the Industry brief and signaled their intent by the 9th of February. I haven’t found any news reports on this either. Finland will probably end up making their decision either the year before or at about the same time as Canada so it will be interesting to see how they go. Given the Canadians will be making the final decision in 2022 I doubt Trump will be a factor. Despite your suggestion Canada is still close to the US politically and militarily and the demands of NORAD “trump” those of NATO, especially under Trudeau. While Rafale is certainly not excluded from the competition there are some obvious issues with selecting it, including integrating into the NORAD structure, weapons compatibility and the lack of industrial support or industry return. Plus it will not be either the most capable platform or the cheapest in 2022 when the decision is made. I feel like equally as likely as any order getting placed is Canada simply not buying anything at all. They are trending more and more in that direction. I wouldn’t be stunned if they just get out of the business. I wouldn’t be stunned if they just get out of the business. That would result in quite a lot of savings; so let's cut defense spending! (As some of our European NATO allies are already doing). If we take that US$20 billion and divide by the 88 aircraft then Canada pays an extra US$220 million for each jet in dev costs… They could of course do it on the cheap and buy an existing radar, engine, EW suite etc but that just translates to Canada system integrating, and taking all the associated risk that brings, while providing little benefit to Canadian Industry. (Hypothetic discussion here obviously) If we are to spend that kind of money for an indigenous fighter program with little hope for exports, may as well look for another type of aircraft that we can actually profitably export. Obviously, get the government to pay 100% of the R&D and the certification process. We just did the opposite and bought back into the NATO AWACS program that the Conservatives withdrew us from in 2011. So it appears that Boeing has decided to join the competition to replace the CF-18. OTTAWA (Reuters) - Boeing Co, locked in a trade dispute with the Canadian government, has applied to stay in the race to supply Canada with 88 new fighter jets, three well-placed sources said on Thursday. Companies had until Feb. 9 to express an interest in taking part in a competition for planes worth between C$15 billion ($12.1 billion) and C$19 billion. Ottawa will release its specifications next year, at which point firms can bid. Boeing did let Canada know it was interested, said the sources, who requested anonymity because they were not authorized to speak to the media. The decision does not mean the firm will necessarily put forward its F-18 Super Hornet. Not sure what else Boeing would offer other tha the F-18, I don't see how the F-15 would be selected by Canada. Noting the article mentioning the anonymity of the source, it is worth posting this news report on how the Liberals continue to undertake unprecedented steps to ensure there is little clarity to this competition. Companies interested in the Liberal government’s planned purchase of new fighter jets have been told not to talk to journalists despite claims by federal officials the process will be open and transparent. Those company representatives taking part in the Jan. 22 industry day in Ottawa, which outlined initial details about the proposed $19 billion acquisition, were required to sign a form agreeing not to share information with the media, according to documents obtained by Postmedia. “Your registration to this event acknowledges your agreement to not share information or materials obtained at the event with the media, and certifies that you are not a member of the media,” the form noted. The Liberal government’s quest to buy new fighter jets has been controversial, with mixed signals and bungled deals. Prime Minister Justin Trudeau said earlier his government would not buy the F-35 stealth fighter, claiming it didn’t work. His government later reversed course, adding that F-35 manufacturer Lockheed Martin was welcome to offer their plane to Canada in any competition. In 2016, the Liberals launched a plan to buy new Super Hornet jets from Boeing as an interim measure, only to scuttle that deal a year later because of a trade war involving the U.S. firm. Instead, the government says it will now buy used F-18 jets from Australia. The gag order on the industry day event was forwarded to Postmedia by company representatives concerned about the excessive government secrecy on a program that will cost taxpayers $19 billion. Public Services and Procurement Canada did not comment on the issue. But it is not the first attempt by the Liberals to crack down on what information might make its way to the public or news media about the multi-billion program. In November 2016 it was revealed the Liberal government brought in an unprecedented gag order that prevents 235 Canadian military personnel and federal workers from ever talking about the program. The non-disclosure agreement for the equipment project puts the fighter jet replacement on the same level as top secret counter-terrorism missions undertaken by the Joint Task Force 2 commando unit as well as clandestine operations by the country’s spies, military sources say. The permanent non-disclosure agreements were uncovered by Conservative defence critic James Bezan after he requested information through the House of Commons “inquiry of ministry” process. The information provided to Bezan noted that 121 individuals at the Department of National Defence were required to sign the non-disclosure agreement, 39 at Public Services and Procurement Canada; and 18 at Innovation, Science and Economic Development Canada. The rest of the 235 were employed by the Department of Finance, Treasury Board, Department of Justice and Privy Council Office. Five other individuals working on the fighter jet replacement project who are under contract to DND were also required to sign the non-disclosure agreement or NDA. “The NDA is a life-time agreement,” the response to Bezan noted. Persons signing the NDA are considered “persons permanently bound to secrecy” on the future fighter jet capability project, it added. Defence industry executives and retired public servants say they have never seen such secrecy surrounding an equipment program. The DND claimed that such agreements have been used with procurement staff before on occasion. But Alan Williams, the former assistant deputy minister for materiel at the DND, has said that he had never heard of such agreements. Over the years Williams oversaw hundreds of equipment projects at both DND and Public Works, worth billions of dollars. The fighter jet industry day involved some 200 participants from 108 companies. Some of those who attended questioned why government officials at the meeting could only provide basic details about the fighter jet program. Industry representatives noted that the purchase, which would see a contract awarded in 2021 or 2022, seems drawn out, considering federal procurement officials have been involved in trying to buy a new jet since 2010. I guess the Liberals don't want the public to know that the F-35 might end up the only suitable choice remaining. Now confirmed by the Canadian Government that Boing is one of the vendors for the CF-18 replacement. No surprise right now on the 5 respective candidates but I wonder how many will drop off over the next two years as further details and requirements for the new project are released. The Canadian government has announced that five bidders — Boeing, Dassault, Eurofighter, Lockheed Martin and Saab — are eligible to compete for a long sought-after contract to replace the country’s 88 CF-18 fighters. The disclosure of the Future Fighter Capabilities Project (FFCP)’s official Supplier’s List ends a mystery about whether Boeing would decline to participate after angering Canadian government officials. The Supplier’s List shows that Royal Canadian Air Force’s options remain plentiful, with the Typhoon, Rafale, Gripen, Super Hornet and F-35 Lightning II available for purchase. The release of the government’s Supplier’s List does not mean the companies are committed to submitting bids for the contract award scheduled 2021 or 2022. “We will continue to evaluate our participation in the FFCP as the Government of Canada outlines the procurement approach, requirements and evaluation criteria,” Boeing says. Some additional info on the Canadian fighter replacement program. Bringing in an independent third party reviewer is a good idea and will hopefully alleviate some of the concerns people have with the competition and the final selection. The federal government has embarked on a couple of initiatives to support the project to buy a new fleet of fighter jets for the RCAF. The aircraft will replace the air force’s CF-18s. Through a Request for Proposal issued Tuesday, the Canadian government will be hiring an independent third-party reviewer to help validate various procurement documents and support processes relating to the Future Fighter Capability Project. The reviewer’s role will be to provide defence procurement and financial expert analysis to ensure that the procurement approach “is designed to deliver the desired outcomes,” according to Public Services and Procurement Canada. Only these suppliers will be invited to participate in subsequent formal engagement activities and to submit proposals, according to the government. In parallel with discussions with these suppliers, the Canadian government will continue to talk to other firms to gather and share general information related to the procurement. This aims to make sure that Canadian aerospace and defence firms can play a role in the procurement. Canada’s auditor general has started to dig into one of the Trudeau government’s most contentious claims, upon which rests the fate of hundreds of millions of taxpayer dollars: that the country is facing an urgent shortage of fighter jets. The claim was first made in November, 2016, when the Liberals announced that Canada didn’t have enough fighter jets to defend North America and simultaneously meet the country’s NATO commitments, and that a stopgap was urgently needed until the entire CF-18 fleet could be replaced. The government originally planned to buy 18 interim Super Hornets from Boeing for $6.4-billion before the deal was scuttled late last year in favour of buying 25 used jets from Australia for $500-million. But critics, including opposition parties and former air force commanders, accuse the government of fabricating an urgent “capability gap” – as the shortfall is known – by changing the military’s requirements to avoid having to buy the F-35 stealth fighter. The Auditor General is also investigating the costs and impact for extending the life of the CF-18 fleet. This report should be out in the fall. This should let Canada delay things yet again. It seems like it’s just time to fess up. Canada has no intention of actually defending itself of contributing militarily to NATO. The budget keeps being cut and actual programs keep getting put off. The fighter plans are a joke. The frigate program has been delayed and delayed and I won’t be shocked if it gets rebid. The submarine program has been awful. The army has been reduced to almost nothing in terms of combat power really. Buy Type 26 like the Aussies did and reap the rewards in being part of a large program. Agree there. A good sign they are serious about turning budget into capability would be if they bought them from the U.K. yards as well. No really much in the way of new information but the submission of bids by May next year. I'd expect some sort of down selection from the five bidders to perhaps two before final offers are tabled. Canada expects to accept formal bids for a new fighter jet in May, with the first aircraft delivered by 2025, according to Canadian government procurement officials. A draft bid package for 88 fighters was issued to companies for their feedback by the end of this year, said Pat Finn, assistant deputy minister for materiel at the Department of National Defence. From there, the final bidding instructions for the CA$16 billion (U.S. $12 billion) procurement will be issued and bids required by May 2019, he added. The aircraft will replace Canada’s current fleet of CF-18 fighter jets. The aircraft expected to be considered include Lockheed Martin’s F-35, the Eurofighter Typhoon, the Dassault Rafale, Saab’s Gripen and the Boeing Super Hornet. The Canadian government will require a robust package of guaranteed industrial benefits or offsets from the winning bidder, government officials said. But that could be a problem for the F-35, as Canada is still a partner in that program, which does not guarantee participating-nations contracts. Work on the F-35 program is based on best value and price. Canadian industrial participation in the F-35 program has reached $1 billion, as more than 110 Canadian firms have landed contracts related to the aircraft program. The issue of industrial benefits has already been discussed with companies interested in bidding on the project, and those talks will continue as feedback is received on the draft bid package, government officials said. Canada continues to try its luck at “having its cake and eating it too”. They continue to pay F-35 program dues to maintain F-35 contracts then run an open competition to select their new fighter aircraft. If the aircraft is not the F-35 then out of the Industrial program they will go, no matter what they have paid to date. Many of the partner nations will be happy to see them go if it provides more opportunity for their own industries. Canada is facing a complex challenge as it gets ready to launch a full competition for new fighter jets stemming from its long-standing involvement in the international coalition that is building the Lockheed Martin Corp. F-35 stealth aircraft. The federal government confirmed on Monday that it will maintain its membership in the F-35 consortium. At the same time, Ottawa is getting ready to send out requests for proposals for new fighter jets to five potential bidders, including Lockheed Martin. Federal officials insist that all bidders will have to adhere to Canada’s Industrial and Technological Benefits policy (ITB), which requires the winning supplier to “make investments in Canada equal to the value of the contract." The cost of replacing the Royal Canadian Air Force’s current fleet of CF-18s is estimated at $26-billion. Under the rules of the F-35 consortium, however, partner countries such as Canada must forego such regional offset programs, which have long been a central element of Canadian military acquisitions. Earlier this year, Canada paid $54-million to remain in the F-35 buyers’ pool. “We’re keeping our involvement alive to get access to that product at the best possible terms,” Pat Finn, an assistant deputy minister at the Department of National Defence, said in an interview on Monday. “If the F-35 were to win, the lowest cost access to the aircraft is through the partnership. Having been involved from the outset, we don’t want to lose the privilege of that." Since 1997, Canada has paid nearly half a billion dollars to stay in the F-35 consortium. Jeff Waring, a director-general at Innovation, Science and Economic Development Canada, said it will be up to Lockheed Martin to determine how it can meet Canada’s requirement for regional offsets if it wants to bid on the contract. “The ITB policy is a market-driven approach; it doesn’t prescribe to bidders how they need to invest in Canada,” he said. The federal government has nearly finalized its request for proposal for the new fighter jets. It is now waiting for industry feedback over the next six weeks before launching the formal competition next year. Three European companies (Dassault Aviation, Saab Automobile and Airbus) and two American companies (Lockheed Martin and Boeing Co.) have said they intend to bid on the contract. In the draft request for proposal, the government has laid out new details on its “economic impact test” that will penalize companies that are deemed to have a negative effect on the Canadian economy. When it was announced last year, the test was dubbed the “Boeing clause” because of U.S.-based Boeing’s trade dispute with Canada’s Bombardier Inc., which Bombardier subsequently won. The new measure is expected to look at whether companies have launched a trade action in the two previous years against a Canadian company. Given Boeing launched its case against Bombardier in 2017, it will likely be in the clear by the time it would have to submit a final bid in 2020. The previous Conservative government had committed to buying F-35 fighter jets, which were deemed at the time to be the only aircraft able to meet Canada’s requirements, in large part because of their stealth capabilities. The current Liberal government has modified the requirements to make sure there can be competition between the various manufacturers. “If your aircraft cannot meet [a requirement] today, we are not saying automatically that you’re out; but you have to tell us what is your solution to meet it, at what price and what schedule,” said Mr. Finn. However, the Liberals also promised to launch an “open and transparent” competition, which is now scheduled to be launched in May. I think over the last 3 months the chances for the Rafale have not been reduced. The following may be a surprise to supporters of the Rafale in Canada... Nothing confirmed yet but it seems likely that Dassault will pull out and you would subsequently expect Saab to probably pull out as well for similar information sharing reasons. Saab may have BAE backing for their information sharing but the cost to bid will be high. Add in BAE having a stake in both the Eurofighter and the F-35 and it seems unlikely that the Gripen will be competitive. The long effort to replace Canada’s aging fighter jets took another surprise twist on Tuesday, as multiple sources revealed that French fighter-jet maker Dassault is pulling out of the multibillion-dollar competition. The decision comes just over a week after the federal government published the military’s requirements for a replacement for Canada’s CF-18s as well as a draft process by which a winning supplier will be chosen. Dassault had repeatedly pitched its Rafale aircraft to Canada over the years as successive governments in Ottawa have wrestled with selecting a new fighter jet. Dassault’s pitch included significant promises, including that it would assemble the planes in Canada. But sources tell The Canadian Press that Dassault’s decision to withdraw was related to the fact France is not a member of the Five Eyes intelligence-sharing network, which counts the U.S., Britain, Australia, New Zealand and Canada as members. The five members have very specific requirements for how their equipment works together. The French government, which had been closely working with Dassault as the most recent iteration of Canada’s fighter-replacement program has inched along over the past year, was preparing to notify Ottawa of the company’s withdrawal. The move leaves four companies — U.S. aerospace giants Lockheed Martin and Boeing, European competitor Airbus and Swedish firm Saab — competing for the $19-billion contract to replace Canada’s 76 CF-18s with 88 new fighters. A contract isn’t expected to be awarded until 2021 or 2022, with delivery of the first new aircraft slated for 2025. In the meantime, the government is planning to upgrade its CF-18s and buy 25 used fighters from Australia as a stopgap. Dassault faced several significant challenges in meeting Canada’s requirements for a new fighter, said defence analyst David Perry of the Canadian Global Affairs Institute, and while they weren’t insurmountable, they would have cost time and money. Those challenges included meeting those Five-Eyes intelligence-sharing requirements, which Perry said put Dassault at a distinct disadvantage in the competition when compared to Lockheed Martin, Boeing and, to a certain degree, Airbus. “For any of the non-American companies, solving the Five-Eyes interoperability issues is going to be challenging,” he said, noting that the U.S. in particular is very sensitive about data-sharing. That could explain why Dassault never established a strong presence in Canada during the many years when it was trying to sell the Rafale as a replacement for the CF-18, he added. The CF-18s are about 35 years old. Canada’s attempts to buy a new fighter jet have dragged on for nearly a decade after the previous Conservative government announced in 2010 that Canada would buy 65 F-35s without a competition, with the first to be delivered in 2015. But the Tories pushed the reset button in 2012 after the auditor general raised questions about the program and National Defence revealed the jets would cost $46 billion over their lifetimes. After campaigning on a promise not to buy the F-35s, the Trudeau Liberals announced in November 2016 they would take their time with a competition to replace the CF-18s, and buy 18 “interim” Boeing Super Hornets without a competition because Canada needed more fighter jets badly. But then Boeing’s trade dispute with Canadian rival Bombardier saw the Liberals scrap their plan to buy Super Hornets and instead begin talks to buy 18 used fighter jets from Australia. A contract for those used planes is expected in the coming weeks. The formal competition to replace the CF-18s is scheduled to begin next spring. The French are escalating the topic, lets see what happens. How are the government relations these days? That is highly unlikely Keesje, Trudeau won’t be able to change the NORAD specific requirements of the tender, especially as the tender documents have already been released to the respective bidders. It would create an instant protest point and with an election less than 12 months away Trudeau doesn't need that kind of publicity. Just to make it clear what the issue around Five Eyes data is you can read the following, https://www.aeromontreal.ca/download/fc ... LETIER.pdf in which slide 7 goes specifically into the information issue. Obviously this is the RCAF side of the deal and there is the industry participation side that has to be considered but you get the idea of how important and valued that information relationship is. To put it clearly, it transcends the political rabble. To give further understanding to the difference in information sharing between respective nations, there is the ACURL lab for F-35 at Eglin which handles specific F-35 mission programming for Australia, Canada and the UK. In the US a software reprogramming laboratory is also under construction, which will support JSF aircraft from Australia, Canada (should Canada eventually purchase the F-35) and the UK. Known as the ACURL (Australia, Canada, UK Reprogramming Laboratory), the facility is adjacent to a similar USRL (for the US Air Force, Navy and Marine Corps) and NIRL (for Norway and Italy). A further reprogramming laboratory will support the remaining partner nations and FMS customers at NAS Point Mugu in California. On top of that, the Rafale would have been an extreme long shot anyways; buying the Rafale means scrapping all existing munitions, pods and support hardware in favour of their (more expensive) French equivalents. And trying to integrate existing weapons and pods onto the Rafale means extensive development, certification, and testing requirements that would be fraught with risk and costs. Things are moving. Agreements, cooperation, self evident follow ups, all seems to be up for discussion / change lately. Specially in this field. Keesje your link is almost two months old and doesn't have any relevance to the current situation or the fighter procurement. - The previous SuperHorner deal killed because of it. The Canadian government’s December announcement did not come as a surprise, partly because of the news leaks earlier in the week, but also because of a rupture in relations between Canada and Boeing earlier in 2017 after the U.S. aerospace giant launched an unfair trade claim against Bombardier Aerospace of Montreal. - The relation is what it is. And yet Boeing is one of the Vendors selected and admitted for the bid. Five, now almost certainly four, who will bid clearly means relations are not that bad that they are excluded up front. Three of the vendors have significant US content in their jets and as already stated up the thread Canada continues to pay its dues to the F-35 Industrial program. Keesje, seen from the RCAF/NORAD perspective the relationship is fine. Seen from the industry perspective, where Canadian companies contribute heavily to the US economy, it is fine. Step away from the bluster of media reporting and you will see that things are humming along as they always have and will continue to, despite two political leaders with heads bigger than their boots having their egos dented. The previous Super Hornet deal got canned because of the optics of buying from a company that was directly involved in harming the Canadian government's investment in domestic industry was terrible, and every military official told the government that they had no need for the Super Hornet, could not supply the personnel to operate the type, could not afford to operate the type, and didn't want the type. They only bought the Australian Hornet's to save face; the government created a fake capability gap to originally justify the purchase of the Super Hornet, so they need to do something to fix the problem they created for themselves; hence the purchase of the Australian fleet of Hornets to save face at taxpayers’ expense regarding the fictitious gap, while the reference to ‘economic harm’ by Boeing was a puerile attempt to deflect the issue from a case of government manipulation of the procurement process to one of economic indignation against Boeing. The assessment tool is still being finalized for this clause, and industry consultation is still occurring. I think the US government stood firm with Boeing in the DoC CSeries case against BBD/Delta. This was after Boeing showed no interest in cooperating with BBD on the Cseries, which drove them in Airbus hands later on. A solid implementation of the America First strategy publicly set out by the presidency the year before. Despite Trudeau & May asking the President to avoid government interference, 300% import tarrifs were set. The US government had all the rights to do so, it helps US jobs and economy. And now it is Canada First. About that Boeing complaint (which was debated here to death), a vague consensus what agreed around the word "hypocrit" in describing Boeing (which was not producing anything close to the CS100, nor did it offer then any US made aircrafts to Delta). The only aim (that Boeing openly stated) was to destroy the CSeries and not repeat the same mistake in letting a new entrant (BBD) in the market. Pretty predatory to me if you ask me. I sincerly hope nobody forgets that behevior in Canada. If this was a legal action to protect national interest and support local jobs, it calculated in fall-out like this I suppose. A few weeks ago Dassault withdrew from competition, because of compliance with the Five Eyes intelligence-sharing network. It could be a challenge to find out how un-touchable that cooperation really is, specially if the dominant partner decides to use it to build new Cold War on China. A good old cold war / FUT with enormous defense budgets How essential is this Five Eyes intelligence-sharing network really for buying a new fighter, if old F18 will do too. It seems CAnada is buyig time. Rewarding Trump with a multi billion order for what he is doing seems unlikely. If a customized Rafales can be build locally by Canadian industry as part of a bigger cooperation with Dassault and Airbus on a 6th Gen fighter, things could get interesting. It totally political, so lets not over state specifications / technicalities. Many earlier decisions have been winded back in this process. Keesje, I said the following in response to a nearly exact comment you made 10 months ago. The only thing that has changed is that Dassault has withdrawn from the competition. Clearly there were issues with integrating it into the NORAD structure and information sharing agreements. Building Rafales in Canada won’t change that nor would what you are suggesting be acceptable with Canadian procurement law. Despite what you suggest, it is not all political. Finally as stated above, NORAD is above Trump and Trudeau and both could very well be out of office by the time this competition is selected and certainly by the first aircraft is delivered. Keesje it is time to face the facts, Rafale is not happening for Canada. The Australian hornets will be going to Canada. The deal was sealed yesterday and 18 RAAF Hornets will be going to Canada this year. Thought I would post this masters thesis submission that looks at the Canadian Future Fighter Capability project. Unfortunately it is essentially a sales campaign for Saab and Gripen and does not objectively look at what the threat will be to Canadian Military Forces in the future, glosses over the current state of the Gripen and uses some sources that have been previously proven as inaccurate. Prime Minister Pierre Trudeau ordered 138 CF-18 fighter jets in 1980. As of September 2018, 76 modernized CF-18s remain in service. Over the past two decades, four different Prime Ministers have been involved in selecting a replacement for the CF-18. With a purchase price of over $16 billion and a potential total lifetime cost of over $40 billion, the CF-18 replacement will be the second most expensive military procurement in Canadian history. Not only will the CF-18 replacement program have to fight for funding against the general austerity and easy riding nature of Canadians, but it will also be running concurrently with the largest military procurement in Canadian history: The National Shipbuilding Strategy. This paper reviews the history of Canadian military procurement, with emphasis on the successful New Fighter Aircraft (NFA) program of the 1970s that selected the CF-18, and how those lessons should be applied to the CF-18 replacement. This paper argues that, absent the political will to provide considerably more than 1.15% of GDP in defence spending, the Canadian Forces can no longer afford to be a modern multipurpose force and should instead move to a Navy centric force structure. By reviewing how the CF-18 serves at home on the NORAD mission, in Europe on NATO air policing missions, and as part of coalition combat missions; the minimum requirements for the CF-18 replacement are identified. This paper recommends employing the NFA methodology to design a defence policy for easy riders. Such a defence policy will meet military objectives with best value, state-of the-art technology that also offers full industrial offsets for Canadian industry. The best value solution to the CF-18 replacement is the least expensive jet in the competition: the Saab Gripen. The irony of the report is that I expect the Saab to withdraw from the Canadian competition at some point in the future before final submission likely for both capability and information sharing reasons similar to Dassault. 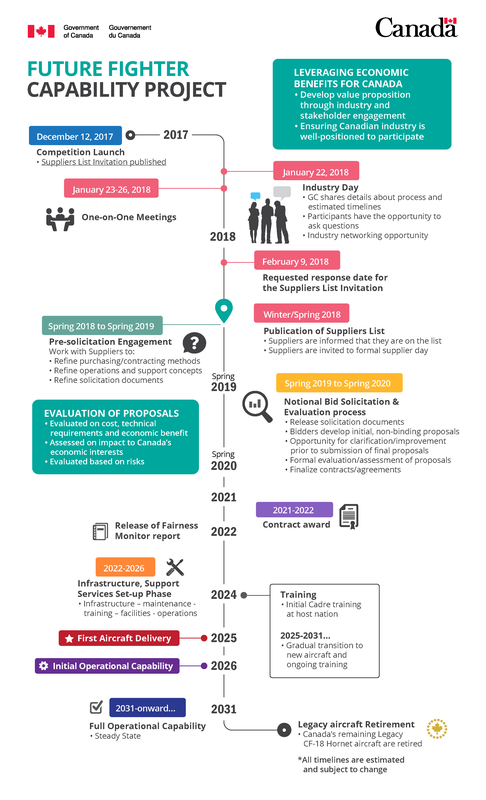 An image outlining the process and timeline as described by the Canadian Government. Not sure why Flight Global are reporting this unless it is just Airbus trying to drum up some news interest in the Eurofighter bid. We have known about a Eurofighter bid for a significant period, after they responded to the Canadian Government's initial RFI. Interesting if the article is true that Airbus Defence is leading the sales campaign. I would have expected BAE Systems given the intelligence sharing requirements but as the RFP is being released mid-year we won’t know the full impact of those specific requirements on the selection. Jacques says the Eurofighter bid will include some sort of participation from Canadian manufacturers, though the type of involvement in the aircraft’s supply chain or extent was not specified. I think the decision comes down to the willingness of Canada to be part of the tip of the spear in a major conflict. Canada has never provided high end fighters in any conflict. The F-35 is the obvious selection if they now want to do so. However there is nothing wrong with Canada accepting their traditional policing role and providing the role of escorting tankers/awacs etc, in lower risk areas. These jobs still need to be filled in a major conflict and it frees up higher end assets to be used in higher risk areas. I think the Gripen has a very good chance. It has the lowest operating costs by a very significant margin. The Hornets have only ever done basic missions and the Gripen will be able to do similar missions for the next couple decades. Single engine over the arctic is only a minor issue which the F-35 also shares. I still don’t see how a single engine fighter would work for us. If northern sovereignty is a priority, and given the size of our airspace, we need something that has a fighting chance of making an airfield on a single working engine. The Super Hornet is still my pick, it’s relatively cheap, available quicker, proven and has some level of commonality with the Hornet. If we get a new government in October, or a minority, I can totally see this project be altered or restarted, once again. The RCAF Hornets contributed significantly during the Balkans conflict, especially in 1999 where they conducted a significant number of A2G strikes. They sat out of the second Gulf War to the detriment of their US relationship for a number of years (in hindsight probably a wise decision…). They dropped a credible number of weapons over Libya and also conducted A2G strikes against ISIS until Trudeau withdrew them. In all of those conflicts the CF-18 was as capable as or more so than comparable aircraft from partner nations. I don’t think so. The intelligence sharing issues that forced Dassault to withdraw present for a start. Secondly the Gripen, even in E form, has the shortest range (with a meaningful payload) of any of the options as well as the least capable set of systems and sensors. It will also likely be unable to lower the cost per aircraft to F-35A levels given the respective production volumes but it may be the cheapest to sustain, at least for a time. I would expect the Gripen to require at least two upgrades over its life of type and more likely three to maintain capability which is the hidden cost of future fighter sustainment. While the Super Hornet seems an attractive choice it goes out of service with the USN in 2040. With only two other operators of the jet, the RAAF who will almost certainly retire the aircraft by 2035 before the USN, and Kuwait, hardly a first tier air force, acquiring the Super Hornet to operate for 30+ years in 2025 is a significant risk. The platform is likely to be unsustainable or simply prohibitively expensive to maintain once it leaves USN service. The single engine/duel engine argument has been discussed here at length but there is nothing to support the argument, with the current generation of engines, that a single engine aircraft is any less reliable. Many nations operate single engine aircraft in similar conditions to Canada and have excellent safety records. To what end? There aren’t any other manufacturers that could realistically offer an alternative and the RCAF have been pretty clear on requirements. The only reason I could see for a delay would be for budgetary reasons but that just pushes the acquisition cost out further and increases the Hornet sustainment cost significantly. 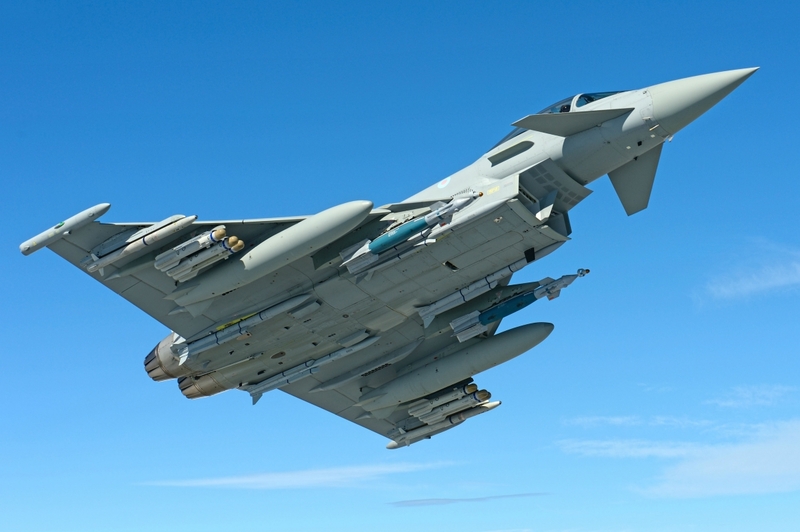 In fact pushing the contest out further would likely see both the Eurofighter and Super Hornet end production while there would be a significant gap until FCAS, Tempest or PCA (if they can even afford it) are available. Imho the only sensible options are Eurofighter and F-35. And EF only if you want 2 engines. I see the EF origin as a traditional cold war interceptor, with the performance, range and equipment for that. Over the years it got adjusted for air to ground. But endurance, long missions and air to ground (stealth) are add on's after the Germans threatened to walk out. You can put on new radar, hang many bombs & missles and many fuel tanks on it, saying it fits the bill. French are aligning exports with the Germans, while Spain is trying secure a place on the table. The Brits are scratching their heads amid this crazy Brexit that industry / military never wanted in the first place.. Maybe there is an opportunity here for the Canadians combining a interim platform with a sixt gen solution. If they don't pick the F-35 (which I don't necessarily think they should) then they need to be kicked out of the F-35 Industrial Share team (or whatever its called). If they want part of the pot, then they need to play some chips. That is a given. Further industrial participation is directly tied to ordering and operating the jet. Should Canada chose a different aircraft for all 88 new jets then Canadian Industry would lose the opportunity to bid on all new contracts and likely have existing contracts wound down as replacement vendors were identified, of which there are many willing participants. Canada has continued to pay their JSF Industrial program payments all through the Trudeau Government highlighting the disparity between the spoken political word and action occurring behind the scenes. The interesting position is if the government tries to satisfy both camps by acquiring two separate aircraft. Ordering a small quantity of F-35s, perhaps 24 to operate for NATO operations, while ordering a second airframe for NORAD duties, is possible but highly unlikely, as I don’t believe the tender has been structured to allow that. A dual aircraft fleet isn’t the cheapest option and as the study I have posted here multiple times from the Canadian Department of Defence, http://army.ca/forums/index.php?action= ... tach=53025 shows two airframes to support the separate NORAD and NATO missions can provide the same capability but only with significant more aircraft and pilots than a single type fleet. I love how ironic this is for the Canadian Government. Flop back and forth and end up having to pay more to support a program the Liberal Government campaigned they would leave. Then run an open competition with signs pointing to the F-35 being selected in 2021, especially if the unit flyaway cost continues to drop as expected below US$80 million by then. "The entire program is believed to have already cost more than US$1 trillion"
Ha, I didn’t even catch that. Very poor journalism at best and blatantly wrong as well. The whole development program and acquisition of 2456 aircraft by the US is approx. $400 billion as per the last SAR. It is only when you include the life cycle costs for operations of those 2456 to 2073, and a host of currency fluctuation, that you get those stupid trillion dollar figures. As for how much money they have spent to date, it is probably in the US$130 billion region worst case scenario. Somewhat of a sales pitch for the Gripen given the line that Russian capabilities such as the S-400 are not as vaunted as they appear to be and therefore non stealth fighters are good enough… Of course when you plan to operate the aircraft for the next 35 years that logic doesn’t exactly hold much water.